Imagine you have two kids. One kid is a model that wants to aspire to be, and the other is considered the worst and no one wants to be involved with him. That is the case, nightly at the “World’s Most Famous Arena”, Madison Square Garden. Considered as the “Mecca of Basketball”, nowadays it should be renamed to as the “Garbage Island of Basketball”. All was going great in the Garden in 1973, the last team, the New York Knickerbockers won the NBA championship. What has followed is 44 years of misery that no fan wants and it does not look like it is going to stop any time soon. Most fans want the owner, James Dolan to sell the team, but that is only the very top of the iceberg of our misery. Last week, JJ Redick called into The Michael Kay Show, to talk about what other players think about the current Knicks situation. To paraphrase, he basically said nobody wants to play the system that the team President, Phil Jackson wants to run. 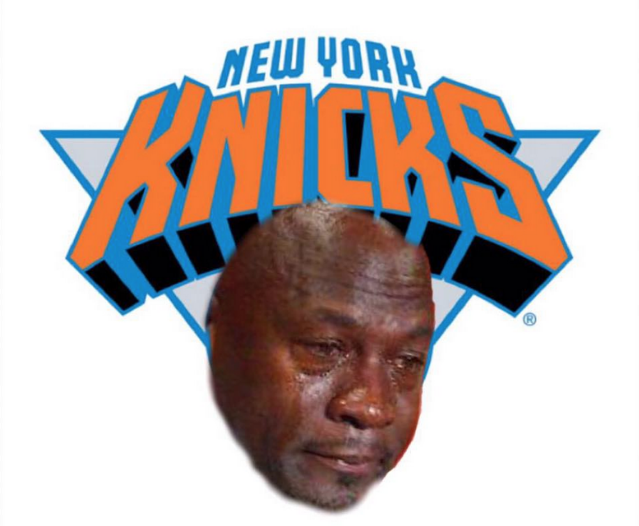 That is a huge blow to our hopes and Knicks are probably going to be bad for 10 years and continue our misery. GREAT!! How can we start trying to limit the fire. FIRE PHIL JACKSON- According to all reports, James Dolan has given Phil Jackson full control of the basketball operations, so putting all the blame on James Dolan is not right. Phil came to New York to make some money before returning to Los Angeles to run his beloved Lakers. Lakers recently hired Magic Johnson to run their basketball, so there is no room for Phil there. Phil, considered by many as the best coach/manager in sports history, might be considered the worst front office member. He simply has not evolved with times, and is forcing the players to run a system, that is not run by any other teams in the association. Firing Phil, will start to change the Knicks’ perception around the NBA, and maybe in a couple of years, top free agents will consider signing with the Knicks. James Dolan needs to step in and fire Phil and start the rebuild before it is too late again. TRADE CARMELO- Carmelo Anthony is one of the best offensive players in the history of the sport, but he simply cannot win by himself. A player that has made it out of the second round of playoffs only once in his career, should not be part of the long term plan of the Knicks. This season, he has a had differences with the organization and his losing ways cannot be allowed to be learned by the young Knickerbockers. Carmelo can still score, trading him this offseason to a team ready to contend, will land quality draft picks for the Knicks to continue their rebuild. BUILD AROUND THE 7 FOOT 3 LATVIAN- I am not going to lie, I am head over heels in love with a 21 year old Latvian, Kristaps “Unicorn” Porzingis. Porzingis, has all the skills necessary to be a future star in the NBA, his progression has halted by this season, where instead of building up his durability, he has been missing a lot of game time due to injuries. The Knicks have a nice couple of pieces that they can build around in Porzingis and Hernangomez. Allowing the young stars to grow instead of contending to win, can only benefit in the long run. The decisions above are some ideal things that the Knicks can make to end the dumpster fire. Knowing the Knicks, they are going to do completely opposite of what the fans want, so the fire is never going to stop. Atleast we have the Rangers who are gearing up a playoff run. LETS GO RANGERS!! !